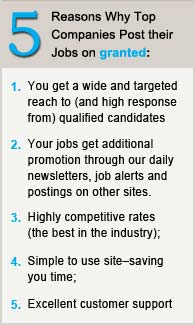 The multiple user access and easy to use interface made it easy for me and my co-workers to alter preferences for job seekers as well as rate and keep track of applicants. Being about 120 miles away from each other really did not matter, as we all were on the same page with regard to our hiring needs. This, in fact, improved the professionalism of our recruiting process and has helped us to schedule meetings with quality candidates. Posting Jobs on Granted has been the wisest decision we've made. The exceptionally well-networked site offers a galaxy of dynamic professionals from which we have, at many instances, made the most suitable choice to fill our active openings. Granted speeds-up the recruiting process considerably and really "takes the work out of hiring." I am impressed with the way this job site works to the recruiters' benefit at the most reasonable price. Uploading job feeds and browsing the site is extremely easy. Being a member of the job site means having access to millions of job seekers from every industry and profession you can imagine. This particularly places Granted a notch above the rest, as it is able to attract most of the relevant traffic at one location. The service was good, I like the website and it was easy to use. I did get lot of applications. The service was worth the cost and I will surely come back to use it, if I have some more postings.